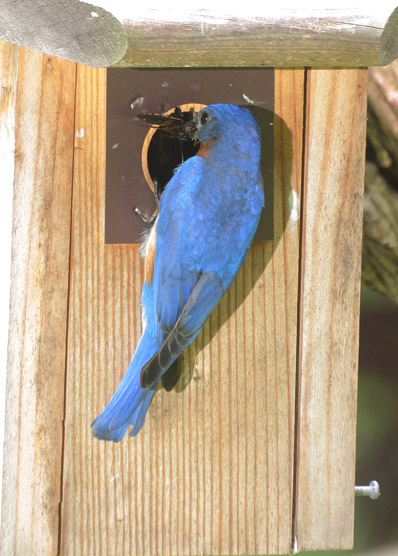 We’ve had a couple of bluebird nest boxes in the yard for the past two years, attracting occupants each spring, and of course this means I’m attempting to get some decent images. What I’m most after are the newly emerged fledglings, the young whippersnappers just leaving the nest, but while waiting I try for feeding shots as well. 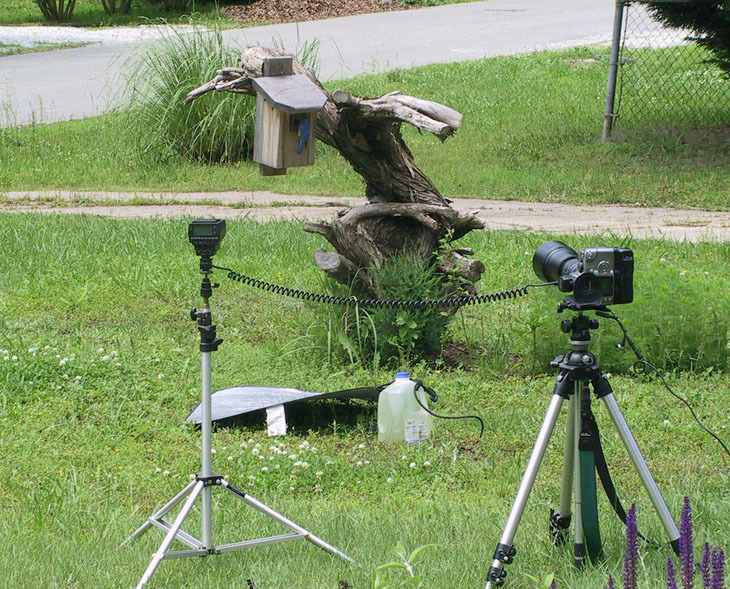 The folks are a tad shy about me looming over their shoulder when feeding – according to a biologist, this is something about not revealing where their young are, but that’s nonsense, since I was the one who put up the nest box, and I’ve told the bluebirds that. But because they’re still neurotic about it, I resort to remote camera work, as seen here. The camera doesn’t have to be very far away, and my focal length was only 230mm for the following images. You can see the flash for supplemental light (mostly trying to throw some into the box,) and the reflector on the ground which was contributing only when the sun dodged from behind the clouds, which wasn’t often (held against the gusting wind by the water jug.) I had a remote shutter release on a long cord and sat six meters away behind another patch of pampas grass out of sight to the right. The fuzzy bunch of weeds to the right of the nest box, by the way, is a new patch of dog fennel, which provided so many photo subjects last year that it’s being encouraged again this year. I had the flash unit dialed up a little too high for the first shots, like that seen here, and eventually changed the camera angle to see if I could get the adults and young framed better. There’s a bit of folklore that animals are scared of a camera flash going off, and I’m happy to tell you that in my experience this is total nonsense. If you think about it, most animals have seen thunderstorms in their lives, and a brief flash of light doesn’t appear on their list of mortal dangers. 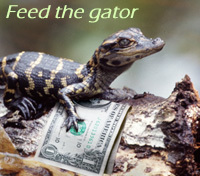 I’ve seen some give a quick start in surprise, only on the first flash, but none that have ever appeared negatively affected – I’m even skeptical that species which are sensitive to light, such as sea turtles and cephalopods, could possibly be affected by a brief flash, because sunlight (which is sustained and many times brighter) would permanently blind them. The bluebirds paid more attention to the shutter noise, and that wasn’t much, since I have 36 images of feeding in a little over an hour – they weren’t exactly spooked. 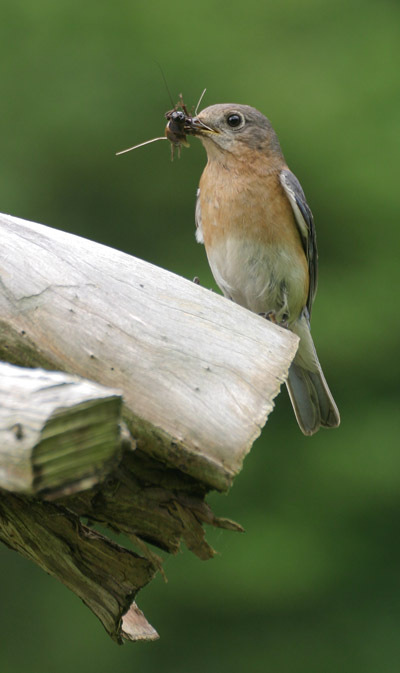 And with most songbirds, the feeding instinct is so high that there’s little that makes them hesitate too long, though it still isn’t worth harassing them to find out what their limits are. Alas, I had a photo student yesterday morning and left to meet with them for a couple of hours. On my return, I sat out and observed the nest box for a while to gauge the activity, which was suspiciously nonexistent; eventually I opened it to check, and yes, it was quite empty. While I was away the fledglings had bailed not just the box, but the entire yard, and were nowhere to be seen, though I spotted the male on the overhead wires twice. My attempts to see where he might have led the offspring were in vain. So much for that photographic resolve. 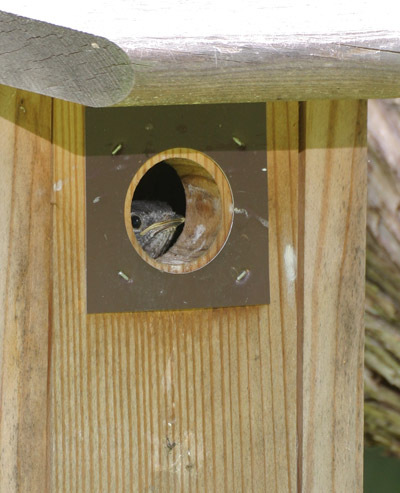 Last year we’d witnessed two different broods in the boxes, so it’s possible I’ll get another chance this year – I’ll just have to keep my eye on them (and keep encouraging the insects in the yard.) In the meantime, I’ll close with the first image I got, while I was still setting up the equipment. I glanced up from focusing the camera to find the female waiting impatiently for me to finish so she could stuff the kids – she was on the stump just to the right of the box. I twitched the camera around and fired off a frame before she could bolt, not even sure if the settings were solid, but I can’t complain about the image at all. And just FYI, we didn’t do that butcher job on the stump, which had been a thick variety of cedar bush. Inexperienced help which misinterpreted the landlord’s instructions had treated it like the pampas grass, which really does need cutting back to practically nothing each winter; the grass grows back, the bush was a goner. If I was more ambitious, I’d try to carve something creative out of it, but right now it serves as a nest box support just fine.